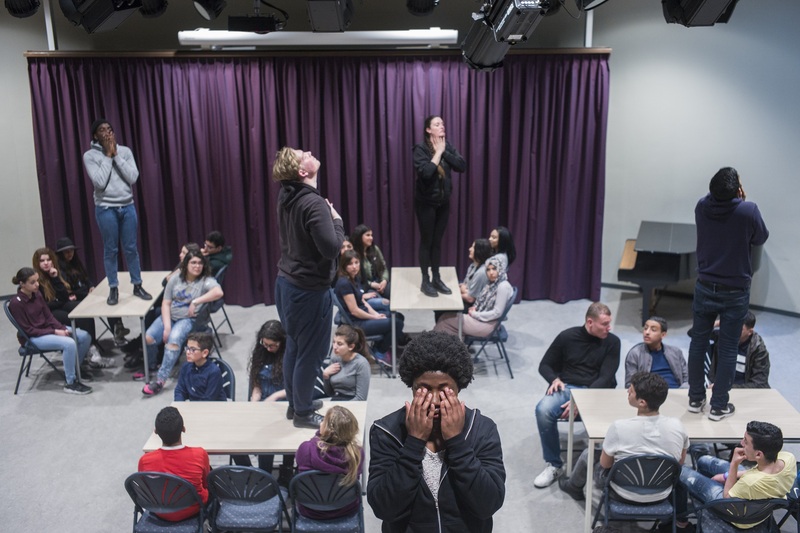 In collaboration with the Anne Frank Foundation, DEGASTEN has developed an interactive performance for high schools students, called ‘Fair Play’. The main themes of this performance are: prejudices, discrimination and group behavior. ‘Fair Play’ has been specially developed for schools with students in the age of 12 to 19, from all kind of levels. Main themes: Why is there a taboo on having prejudices, while everyone has them? What kind of prejudices do we have towards each other and how do we deal with them? DEGASTEN has examined these questions with his students and has developed a highly energetic and interactive performance, including education material, workshops and Q&A’s about prejudices, discrimination, collaboration and group behavior. ‘Fair Play’ is a 45 minute performance, specially made to play in schools for a maximum of 72 students per show. Fair Play can be booked until June 2017. On a yearly basis, DEGASTEN is creating projects for more than 20 schools in the Netherlands. Together with the teacher/school, DEGASTEN is developing activities, performances and workshops made to measure the specific level and age of the students. Projects can be from 2 hours up to weekly classes for one year, depending on its goal. DEGASTEN works with trained theatre- and dance teachers and with peer educators: young actors from DEGASTEN that have been trained to assist the teachers. Because peer educators have more or less the same age as the students, the workshops, performances and classes are much more interactive and fun to join. Creating location theatre performances with one or several classes to create teambuilding. Workshops about ‘how to present yourself’ and ‘discover your own talents’, up from 2 hours until 20 hours with an end presentation. Workshops about working together, teambuilding and trust, given in classes that have issues with these subjects. Playing shows and providing workshops based on the societal themes of the show (such as sexuality, consumption, family bonds, cultural differences and bullying. Workshops for students who are learning the Dutch language. Creating group presentations based on themes given by the school.